Background: Xenotropic murine leukemia virus-related virus (XMRV) is a gamma retrovirus, which has been detected in patients with prostate cancer, chronic fatigue syndrome, and general population with a number of acquired infections such as infection with human T-cell lymphotropic virus (HTLV) and human immunodeficiency virus (HIV). The aim of this study was to determine the HTLV-1 and XMRV coinfection for the first time in Iranian patients who were admitted to the Tehran hospitals. Materials and Methods: Two hundred and ninety one patients suspected with HTLV-1 were referred to the hospitals affiliated to the Iran University of Medical Sciences, Tehran, Iran from April 2012 to October 2016. Genomic deoxyribonucleic acid (DNA)/ribonucleic acid (RNA) from peripheral blood mononuclear cells/cerebrospinal fluids was extracted by High Pure Viral Nucleic Acid Kit (Roche, Germany). After complementary DNA synthesis, conventional reverse transcriptase polymerase chain reaction was used for the detection of HTLV-1 or XMRV-infected patients. Statistical Package for Social Sciences (SPSS) software, version 16 (SPSS, Chicago, IL, USA) was used for statistical analyses. Results: Of the 291 patients suspected of HTLV infection, 123 (42.3%) were male with a mean age of 38±15 years. HTLV-1 RNA was found in 93 (31.9%) specimens comprising 40 men (41.3%) and 53 women (56.9%). Of the 93 patients who were HTLV-1 positive, one sample (1%) was positive for XMRV env gene. Conclusion: These findings suggest that the lack of significant detection of XMRV in patients who were HTLV-1 positive could not be associated with complications of HTLV-1. Although this is a preliminary report from Iranian patients with HTLV-1, further studies are needed to show the actual prevalence of XMRV infection by geographical distribution and various populations. Blood or other body fluids are the shared routes of transmission for all four known human retroviruses: human immunodeficiency virus (HIV)-1, HIV-2, HTLV-1, and HTLV-2.,, To date, no definitive route of transmission has been found for XMRV., Some studies have suggested that XMRV could be associated with HTLV-infected individuals and this virus may be associated with a range of disorders.,, In this regard, the aim of this study was to detect HTLV-1 and XMRV coinfection in Iranian samples using reverse transcriptase polymerase chain reaction (RT-PCR) technique. In this cross-sectional study, the patients suspected of HTLV-1 symptoms were referred to hospitals affiliated to the Iran University of Medical Sciences, Tehran, Iran, as practitioner diagnosed and enrolled them from April 2012 to October 2016. Written informed consent was obtained from each patient. The ethics of the study followed the guidelines of the ethical committee of the Iran University of Medical Sciences. This study included patients who had symptoms of HTLV-1 involvement (malignancy, neurological disease, strongyloidiasis, and bronchiectasis). Patients who did not meet the inclusion criteria were excluded. Five milliliters of peripheral blood was collected from 127 patients into sterile ethylenediaminetetraacetic acid (EDTA)-containing Vacutainer tubes. After centrifugation, peripheral blood mononuclear cells (PBMCs) were isolated from the whole blood (WB) samples by using Ficoll separation method (Lympholyte H; Cedarlane, Hornby, Canada).,, Briefly, the isolated PBMCs were washed three times with phosphate-buffered saline, and then the cells were resuspended in 200 μL of RNAlater solution (Ambion, Austin, TX). Furthermore, 2.5mL sample of cerebrospinal fluid (CSF) was taken from 164 patients and stored without any preservatives and was directly used to further the extraction procedure. All specimens were stored at −80°C until use. Total DNA/RNA was isolated via the High Pure Viral Nucleic Acid Kit (Roche, Germany). Briefly, 200 μL of PBMC or CSF was used for RNA purification, according to protocol., Then, eluted RNA quantity and purity were evaluated using a NanoDrop ND-1000 (Thermo Scientific, Wilmington, DE) spectrophotometer. Extracted mix was stored at −20°C until use. RNA in the total nucleic acid isolates was reverse transcribed to complementary DNA (cDNA) by random hexamers as primers and M-MuLV reverse transcriptase, according to the manufacturer’s instructions., Then, the cDNA was checked for quality using the NanoDrop ND-1000 (Thermo Scientific). Total mix was stored at −20°C and was used for further analysis by PCR. Two separate conventional RT-PCRs were performed for the ampliﬁcation of env and tax genes of XMRV and HTLV-1, respectively. The primers previously described were used for molecular detection via RT-PCR technique for these two targets [Table 1]., A total volume of 25 μL reaction mixture consisted of a 5-μM concentration of cDNA samples or controls, a deoxyribonucleoside triphosphates (dNTPs) mix (Fermentas, Germany) with equal concentrations of each of the four dNTPs at a 1mM concentration, each of forward and reverse primers at 1 μM concentration, MgCl2 solution (Fermentas) at 1 μM concentration, 2.5 μM concentration PCR buffer 10x (Fermentas), and 0.5 units/μL concentration of Taq DNA polymerase (Fermentas), and sterilized distilled water was added to round out the total volume. A Bio-Rad (T100 Thermal Cycler) thermo cycler was used for PCR with the following program: one cycle of initial denaturation at 95°C for 5min; 35 cycles of denaturation at 95°C for 30s; annealing at 51°C and 56°C for 30s for XMRV and HTLV-1, according to the primers melting temperature, respectively; extension at 72°C for 30s, according to the length of the product; and ﬁnally, one cycle of ﬁnal extension at 72°C for 5min. Positive controls for HTLV-1 and XMRV were the MT-2 cell line DNA and XMRV-infected LNCaP cell DNA, respectively. 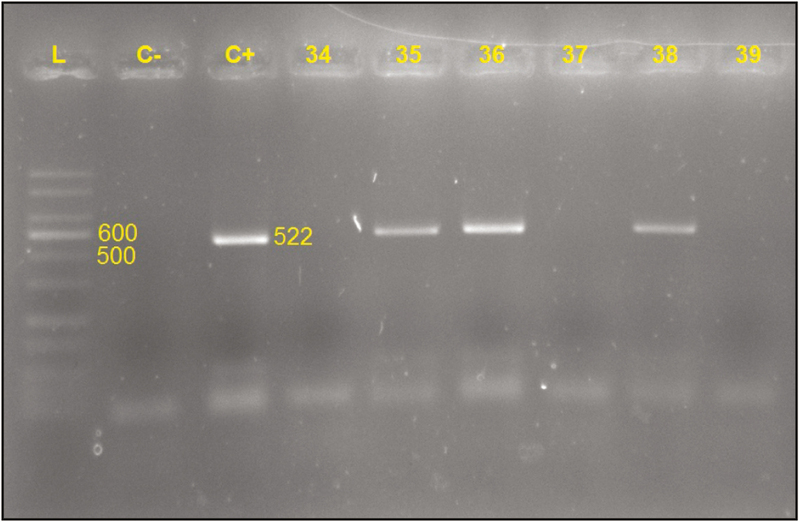 Finally, the PCR products were visualized by gel electrophoresis in a 1.5% agarose gel stained with ethidium bromide. SYBR™ Green real-time PCR was performed for viral load assay and quantified in the Rotor-Gene-Q 6000 thermocycler (Corbett, Australia). A total of 15 μL reaction mix composed of 7.5 μL of 2× Amplicon III mix (Odense M, Denmark), 0.5 μL of each forward and reverse primers corresponding to 0.5-μM concentration, and 3 μL each sample or control corresponding to 0.2–0.5 μM concentration. Primer sequences were obtained from an earlier study by Matsumoto et al. Heating protocol was 95°C for 5min, followed by 40 cycles at 95°C for 30s, 60°C for 30s, and acquiring was in annealing/extension step. Data were analyzed with Statistical Package for Social Services (SPSS) software, version 16 (SPSS, Chicago, IL) for statistical analyses and basic descriptive and frequency features, and then statistical significance was assessed by two-tailed Student’s t-test. P values less than 0.05 were considered to be statistically signiﬁcant. From 2012 to 2016, 291 patients with HTLV-1 symptoms (malignancy, neurological disease, strongyloidiasis, and bronchiectasis) were diagnosed by specialists and referred to hospitals affiliated to the Iran University of Medical Sciences, Tehran, Iran. The mean age of the patients was 38±15 years and 123 (42.3%) were male and 168 (57.7%) were female. One hundred and twenty-seven samples were collected in a 5-mL tube containing EDTA, and RNA was extracted from PBMC using Ficoll gradient method. Also, 164 CSF samples (2.5mL) were collected from the C7-T1 interspace in each patient using 2% gauge spinal needles [Table 2]. The RT-PCR assay showed that of 291 samples, 93 (31.9%) were positive for HTLV-1 tax gene [Figure 1]. The mean age of positive patients was 40±12 years (range, 18–74 years), and further characteristics are described in [Table 3]. Majority of positive samples included PBMCs (77.4%). Figure 1: Agarose gel electrophoresis of human T-cell lymphotropic virus type 1 (HTLV-1) reverse transcriptase polymerase chain reaction (RT-PCR) products. The RT-PCR assay results for the detection of XMRV nucleic acid on 93 HTLV-positive samples showed that 1/93 (1%) male samples were positive for XMRV infection [Figure 2]. 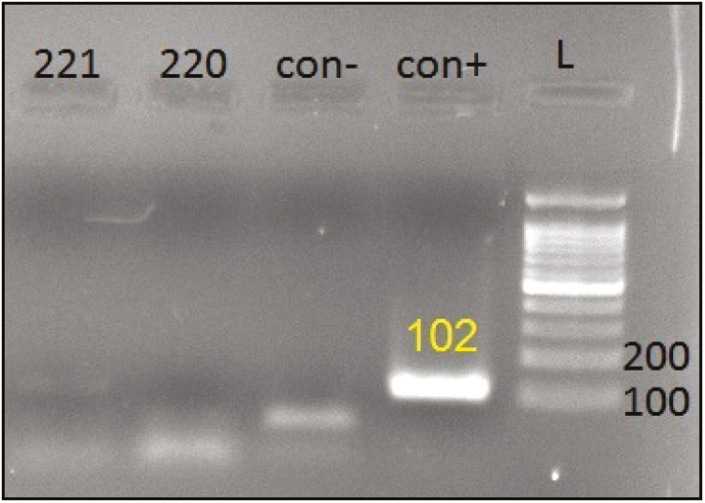 Figure 2: Agarose gel electrophoresis of xenotropic murine leukemia virus-related virus (XMRV) reverse transcriptase polymerase chain reaction (RT-PCR) products. Also HTLV-1 viral load assay (HTLV RNA) performed randomly for 16 HTLV-positive sample (8 female and 8 male) with mean age of 38.8±8.4 years and range, 24–58 years. Viral load assay ranged between 2,655 and 120,867 IU/mL and mean was 5,163 IU/mL. Statistical analyses showed no significant results between demographic parameters and HTLV-1- or XMRV-infection-positive results. To find out how XMRV infection causes any disease in the human population, it is important to detect this virus particle in clinical samples in different complications. In this study, we investigated the presence of XMRV genome in WB (PBMC) and CSF of patients who were HTLV-1 positive for the first time in Iran. Two hundred and ninety-one patients between 2012 and 2016 with HTLV symptoms were enrolled. Results show that from 291 WB (PBMC) and CSF samples, 93 (31.9%) were positive for HTLV-1 by RT-PCR method. For the evaluation of viral load, quantitative PCR (qPCR) was performed in positive patients that ranged between 2,655 and 120,867 IU/mL. In the next step, 93 HTLV-1-positive samples for the presence of the XMRV were investigated. Results showed one WB sample was positive for this virus, which suggests that XMRV is uncommon in this population-based cohort. In the study by Qiu et al., XMRV prevalence in 486 HTLV-infected Japanese patients was evaluated by chemiluminescence immunoassays (CMIAs) and RT-PCR methods. Results showed p15E antibodies detected by CMIA method in 20 (4.1%) samples, but no XMRV pol or env sequences were detected in these seroreactive samples by RT-PCR. The present study that performed just RT-PCR method for XMRV genome detection, notified the need to another confirmatory procedure to validate results. In 2017, Baig et al. attempted to investigate the possible association between the XMRV infection and different variants of ductal prostate adenocarcinoma. The results showed that the XMRV DNA was detected in four of eight (50%) ductal adenocarcinomas. In another cross-sectional survey in 2017 by Vasefi et al., frequency of XMRV genome in 150 Iranian HIV-infected patients was evaluated. Their results showed that 13 (8.6%) plasma samples were positive for XMRV using real-time RT-PCR. In the current study, although there were quality checking in every steps, the method of detection probably had effects on the low infection frequency findings. Different complications of patients who infected by HIV and HTLV-1 might be another term to seen the reduced infection rates of our studied population. There were some limitations in this study, including small sample size, applying highly sensitive or confirmatory techniques, and not using several primers to detect other XMRV genes, which need to be taken into account in future studies, although this was an only preliminary study in Iranian patients with HTLV-1. On the basis of our results, we found that the prevalence of XMRV infection is low among patients who acquire HTLV-1 infection. This study showed that the individuals at risk for HTLV-1 infection are not at risk for XMRV infection. In this study, we failed to find any significant correlation between XMRV infection and HTLV-1 complications. In view of these negative findings in this highly susceptible group, we conclude that it is unlikely that XMRV or related viruses are circulating at a significant level in patients who are HTLV-1 positive in Tehran, Iran. The present study was done by supports of Iran University of Medical Sciences, Tehran, Iran in order to a separate project by the grant number: 95-04-30-27632. Vasefi SN, Bokharaei-Salim F, Tavakoli A, Keyvani H, Farahmand M, Mortazavi HS, et al. Xenotropic Murine leukemia virus-related virus (XMRV) in Iranian HIV Patients. Iran J Virol 2016;10:8-13. Henrich TJ, Li JZ, Felsenstein D, Kotton CN, Plenge RM, Pereyra F, et al. Xenotropic murine leukemia virus-related virus prevalence in patients with chronic fatigue syndrome or chronic immunomodulatory conditions. J Infect Dis 2010;10:1478-81. Yari A, Rezaee SA, Valizadeh N, Rajaee T, Jazayeri SM, Soltani M, et al. Evaluation of HTLV-1 activity in HAM/TSP patients using proviral load and tax mRNA expression after in vitro lymphocyte activation. Iran J Basic Med Sci 2014;10:531-6. Lee D, Das Gupta J, Gaughan C, Steffen I, Tang N, Luk KC, et al. In-depth investigation of archival and prospectively collected samples reveals no evidence for XMRV infection in prostate cancer. PLoS One 2012;10:e44954. Arnold RS, Makarova NV, Osunkoya AO, Suppiah S, Scott TA, Johnson NA, et al. XMRV infection in patients with prostate cancer: novel serologic assay and correlation with PCR and FISH. Urology 2010;10:755-61. Fischer N, Hellwinkel O, Schulz C, Chun FK, Huland H, Aepfelbacher M, et al. Prevalence of human gammaretrovirus XMRV in sporadic prostate cancer. J Clin Virol 2008;10:277-83. Gray ER, Garson JA, Breuer J, Edwards S, Kellam P, Pillay D, et al. No evidence of XMRV or related retroviruses in a London HIV-1-positive patient cohort. PLoS One 2011;10:e18096. Erlwein O, Kaye S, McClure MO, Weber J, Wills G, Collier D, et al. Failure to detect the novel retrovirus XMRV in chronic fatigue syndrome. PLoS One 2010;10:e8519. Spindler J, Hackett J Jr., Qiu X, Wiegand A, Boltz VF, Swanson P, et al. Prevalence of XMRV nucleic acid and antibody in HIV-1-infected men and in men at risk for HIV-1 infection. Adv Virol 2011;10:268214. Azarpazhooh MR, Hasanpour K, Ghanbari M, Rezaee SA, Mashkani B, Hedayati-Moghaddam MR, et al. Human T-lymphotropic virus type 1 prevalence in northeastern Iran, Sabzevar: an epidemiologic-based study and phylogenetic analysis. AIDS Res Hum Retroviruses 2012;10:1095-101. Yamanaka S, Nakayama K, Tamai H, Sakamaki M, Inokuchi K. Adult T-cell leukemia-lymphoma complicated by Takotsubo cardiomyopathy and HTLV-1-associated myelopathy after treatment with the anti-CCR4 antibody mogamulizumab. Rinsho Ketsueki 2017;10:309-14. Abrams A, Akahata Y, Jacobson S. The prevalence and significance of HTLV-I/II seroindeterminate Western blot patterns. Viruses 2011;10:1320-31. Willems L, Hasegawa H, Accolla R, Bangham C, Bazarbachi A, Bertazzoni U, et al. Reducing the global burden of HTLV-1 infection: an agenda for research and action. Antiviral Res 2017;10:41-8. Satake M, Yamaguchi K, Tadokoro K. Current prevalence of HTLV-1 in Japan as determined by screening of blood donors. J Med Virol 2012;10:327-35. Tavakoli A, Karbalaie Niya MH, Keshavarz M, Ghaffari H, Asoodeh A, Monavari SH, et al. Current diagnostic methods for HIV. Future Virol 2017;10:141-55. Cornelissen M, Zorgdrager F, Blom P, Jurriaans S, Repping S, van Leeuwen E, et al. Lack of detection of XMRV in seminal plasma from HIV-1 infected men in the Netherlands. PLoS One 2010;10:e12040. Panelli S, Lorusso L, Balestrieri A, Lupo G, Capelli E. XMRV and public health: the retroviral genome is not a suitable template for diagnostic PCR, and its association with myalgic encephalomyelitis/chronic fatigue syndrome appears unreliable. Front Public Health 2017;10:108. Qiu X, Swanson P, Tang N, Leckie GW, Devare S, Schochetman G, et al. Prevalence of XMRV in blood donors, HTLV and HIV cohorts. Retrovirology 2011;10:A222. Karbalaie Niya MH, Salman-Tabar S, Bokharaei-Salim F, Behmanesh M, Keyvani H. Prevalence of resistant associated variants (RAVs) in the naïve HCV patient candidate for direct acting antiviral (DAA) therapy. Microb Pathog 2017;10:166-70. Safarnezhad Tameshkel F, Karbalaie Niya MH, Sohrabi M, Panahi M, Zamani F, Imanzade F, et al. Polymorphism of IL-28B gene (rs12979860) in HCV genotype 1 patients treated by pegylated interferon and ribavirin. Iran J Pathol 2016;10:216-21. Keyvani H, Karbalaie Niya MH, Esghaei M, Bokharaei-Salim F, Monavari SHR. Presence of human herpesvirus 8 (HHV-8) DNA sequences in patients with lymphoproliferative diseases and chronic blood disorders. Microb Pathog 2017;10:431-4. Karbalaie Niya MH, Bokharaei Salim F, Tavakoli A, Reza Monavari SH, Esghaei M, Tameshkel FS, et al. Varicella zoster virus genotyping in chickenpox patient’s clinical isolates from Iran. Future Virol 2016;10:401-9. Moradi P, Keyvani H, Javad Mousavi SA, Karbalaie Niya MH, Esghaei M, Bokharaei-Salim F, et al. Investigation of viral infection in idiopathic pulmonary fibrosis among Iranian patients in Tehran. Microb Pathog 2017;10:171-4. Reza MA, Fahimeh G, Reza MH. Evaluation of xenotropic murine leukemia virus and its R426Q polymorphism in patients with prostate cancer in Kerman, southeast of Iran. Asian Pac J Cancer Prev 2012;10:3669-73. Abbaszadegan MR, Gholamin M, Tabatabaee A, Farid R, Houshmand M, Abbaszadegan M. Prevalence of human T-lymphotropic virus type 1 among blood donors from Mashhad, Iran. J Clin Microbiol 2003;10:2593-5. Matsumoto C, Sagara Y, Sobata R, Inoue Y, Morita M, Uchida S, et al. Analysis of HTLV-1 proviral load (PVL) and antibody detected with various kinds of tests in Japanese blood donors to understand the relationship between PVL and antibody level and to gain insights toward better antibody testing. J Med Virol 2017;10:1469-76. Robinson MJ, Erlwein OW, Kaye S, Weber J, Cingoz O, Patel A, et al. Mouse DNA contamination in human tissue tested for XMRV. Retrovirology 2010;10:108. Urisman A, Molinaro RJ, Fischer N, Plummer SJ, Casey G, Klein EA, et al. Identification of a novel gammaretrovirus in prostate tumors of patients homozygous for R462Q RNASEL variant. PLoS Pathog 2006;10:e25. Baig FA, Mirza T, Hamid A, Syed S, Jamal Q. Ductal variant of prostate adenocarcinoma harbor xenotropic murine leukemia virus related virus (XMRV) infection: a novel finding in subtype of prostate cancer. Turk J Urol 2017;10: 268-72. Delviks-Frankenberry K, Cingöz O, Coffin JM, Pathak VK. Recombinant origin, contamination, and de-discovery of XMRV. Curr Opin Virol 2012;10:499-507. Johnson AD, Cohn CS. Xenotropic murine leukemia virus-related virus (XMRV) and the safety of the blood supply. Clin Microbiol Rev 2016;10:749-57. Qiu X, Swanson P, Luk KC, Tu B, Villinger F, Das Gupta J, et al. Characterization of antibodies elicited by XMRV infection and development of immunoassays useful for epidemiologic studies. Retrovirology 2010;10:68. Munro AC, Houldcroft C. Human cancers and mammalian retroviruses: should we worry about bovine leukemia virus? Future Virol 2016;10:163-6.